It's in teens here, and while I may have been cooped up inside for the past few days, I'm growing things. Like real green things that I can eat. Sound too good to be true? I'm talking about sprouts as in hippy-dippy alfalfa sprouts that crunchy, granola-loving peeps ate back in the sixties, then again in the nineties, and then again now. Except they're way cooler now, if only because I said so. I'm telling you—they're back. Why am I telling you about sprouts in the middle of winter? For one, they are super-easy to grow inside, right on your counter top—trust me, I have a black thumb and I can grow oodles of them—and two, they are an amazing way to get that much closer to eating healthy. In my second post for Terrain, I discuss how growing your own food can actually help you check off that New Year's resolution to get healthier (here's the first post in case you missed it). 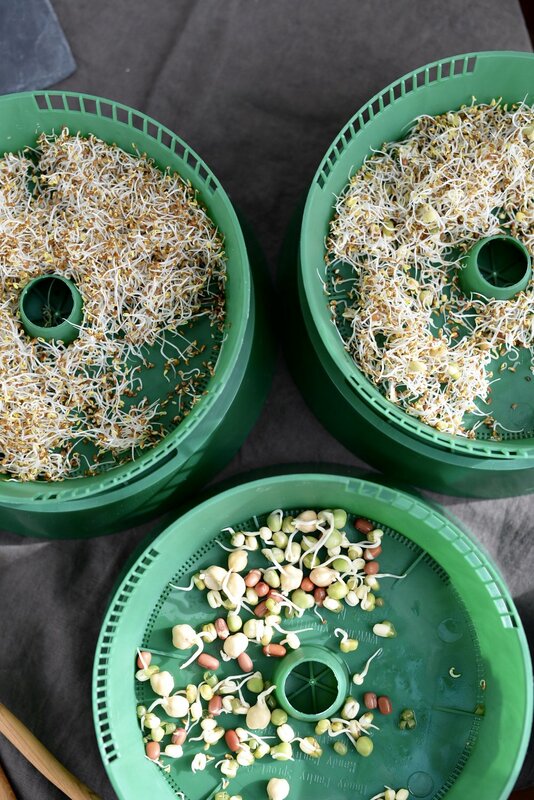 I give simple growing instructions, and while all you need is a jar, a few days, and a few rinses under the sink, Terrain sells these cool sprout growing contraptions that enable you to always have sprouts on hand. There are so many different types of sprouts if alfalfa isn't your thing, like mung bean, broccoli, radish, lentil. They add a pop of brightness to sandwiches, but I also love them tossed in salads. In this post, I share a recipe for a Winter and Quinoa Sprouts Salad with Tahini Dressing that features some of my favorite winter vegetables like radicchio, beets, and sweet potato alongside quinoa, creamy avocado, and a medley of sprouts. I hope you find it as addicting as I do! You can find my tips and recipe on the Terrain blog. Missed the previous Terrain post? Find it here. I have a habit of roasting most veggies that come across my counter in the winter months. I mean, who doesn't love a roasted Brussels sprout or Roasted Green Beans with Roasted Garlic Vinaigrette ;)? But as I was thinking about Thanksgiving and the number of heavy mashes, purees, gratins, and bakes, I wanted to break things ups with a fall-inspired salad. Like my green beans, this only gets better with a little time in the fridge, making it ideal for those who like to get ahead. Think of it as a coleslaw, but better. No mayo, just olive oil, and it has a ton of festive add-ins that make it holiday-worthy. 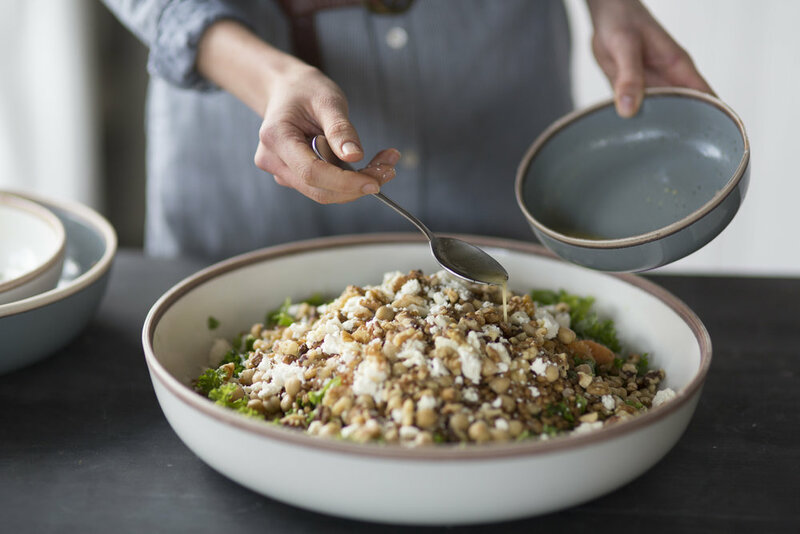 Add a sturdy grain like farro or wheat berries, and some chickpeas and it can also be your go-to lunch salad. Shaving the Brussels sprouts makes them feather-light and a bit wispy, which I love, but it does take a little time to trim them all down. I used a v-slicer (a cheapo mandoline) for some and a knife for others. Turn on the radio or a favorite TV show, and next you thing you know, you have a delicious fall salad. Just don't tell the Brussels sprouts haters what it is until after they tell you how yummy it is. If you are making this ahead of time, add the almonds right before serving so you don't lose the crunch. I say apple is optional here, and if you plan to use it, it adds fantastic crispness. Just be sure to toss with a little lemon juice or add close to serving to prevent browning. Place sliced Brussels sprouts in a bowl. Mix mustard, maple syrup, vinegar, and pinch of salt in a bowl. Slowly whisk in olive oil until emulsified. Drizzle dressing over Brussels sprouts and mix well to coat. Add cranberries, almonds, pomegranate seeds (and apple, if using! ), and toss to combine. Season to taste with salt and pepper. Can be made ahead of time; it tastes even better the next day! Just wait to add the almonds (and apple) until immediately before serving. Serves 4-5. Kale salad has lovers and haters. There are also those people who roll their eyes at a another. kale. salad. but eat it anyway. I know, I know. But there are a few reasons why kale keeps hanging around. For one, it's durable. It can last for a while in the fridge compared to more delicate lettuce. It's more toothsome compared to spinach which had it's hey-day nearly a decade ago. It's also a nutritious and fiber-rich green that can take a beating (i.e. get sliced, massaged, and tossed) and still taste better the next day. For a girl who loves to shop once per week and batch cook, it's a winner. This salad could certainly be a meal on it's own, but I sometimes enjoy it with a local egg or two that I've hard-boiled and sprinkled with sea salt. Sliced avocado? Always a good idea. The components are quick to come together and it makes for perfect take-to-work lunches. Other grains, like farro or wheatberries or even quinoa, can be substituted for similar results, but I think chickpeas give the best texture here. I recommend making extra dressing to have on hand for any other green things or grain things you're making for the week. This salad is plant protein-rich with chickpeas, bulgur, and sunflower seeds and nutrient-dense. The apples give a lovely sweet-tart crunch, but a handful of chopped dried apricots would lend a sweet chewiness that would satisfy too. Once you get the basics, play around with it to create your own version! And then let me know about it. Don't be intimidated by the three recipes here. It all comes together in a pinch. Cook bulgur. Place ¾ cup bulgur in a bowl. Add 1 ½ cups boiling water, stir and let stand 25 minutes. Fluff and drain off any excess liquid. Yields 2 cups soaked bulgur. Assemble bowl. Mix together cooked bulgur, massaged kale, chickpeas, sunflower seeds, and apple. Drizzle with ¼ cup vinaigrette and toss together. Adjust salt and pepper to taste, and serve. Serves 3-4 as a salad or light meal. Massage kale leaves with oil until softened and tender, about 1-2 minutes. Store in refrigerator for 4-5 days. *lacinato or dino kale has rich dark leaves and is more tender, but curly kale (either green or Russian red types) can also be used. Add all ingredients to a jar and shake. Season to taste with salt and pepper. Use throughout the week. Makes approximately 3/4 cup.